Now one of the last remaining Horse-Drawn Barges in the UK, a trip on the Tivertonian offers a truly unique and memorable experience of yesteryear for you and your family to enjoy! The fastest way to slow down on a traditionally painted wide beam barge. 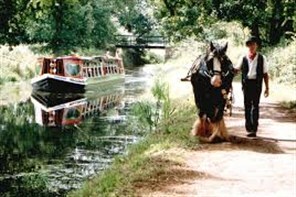 Our most loved and popular trip is a 2 ½ hr return, where the barge travels for 1 hour to East Manley, then turns around and moors up, allowing you the opportunity to take a short walk to see the aqueduct, (designed by Brunel's team of railway engineers), or talk to the horse as he rests for a while under the shade of a tree. During your special journey, you hear memorable tales, anecdotes and historical facts about the Horse-Drawn Barge and the Grand Western Canal. There is often 2 minutes silence... where the peace and tranquility of travelling by Horse-Drawn Barge can be fully appreciated. The fantastic design of this Horse-Drawn Barge, means it matters Not what the weather decides on the day of your trip, . . Large sliding picture windows can be raised or lowered. Up, to keep warm, snug and dry or Down to create an open-air atmosphere on those fine summer days and evenings. Relax, Socialise and enjoy the unique and tranquil delights of the Ducks Ditty Café Bar, permanently moored at Tiverton Wharf on the banks of the Grand Western Canal. Step aboard and enjoy the relaxed and friendly atmosphere. The Ducks Ditty is a genuine artisan coffee house with trained baristers  Espresso, Cappuccino, Latte or Mocha, alongside tempting sweet and savoury treats. Also fully licensed. Canal Cruise approx 14.00 for 2 1/2 hours.